Guess I will create a new category for this topic, once I decide on a way to categorize it. "Things Not to Drive Drunk" doesn't seem right; you shouldn't drive anything drunk, or at least anything that goes faster than walking speed, but that's getting too complicated. 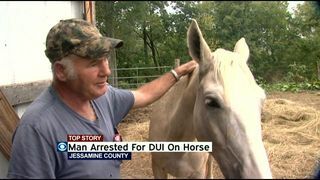 Well, I'll decide that later so as not to delay this important news: it appears to be possible in Kentucky to get a DUI while on horseback. I've mentioned this legal question at least once before, back in 2007 when an Alabama woman was arrested for riding a horse while under the influence of between one and three substances. In some states, the DUI laws apply only to operators of "motor vehicles," and in those states I would insist that riding a horse doesn't count because (wait for it, please) horses don't have motors. But in Alabama, the statute made it illegal to ride "any vehicle," and arguably a horse would qualify. Unfortunately for the man accused of this in Kentucky, that conclusion seems even stronger under that state's law. First, the facts. WKYT reported on Monday that a 55-year-old Jessamine County man had been cited for riding while intoxicated. The man said he was trail-riding with some friends and had stopped to have something to eat "when the deputy arrived and told me to get off my horse." He explained that he is severely diabetic and hadn't eaten, and that is why he staggered after dismounting, not because he was intoxicated. It's entirely possible that this story is true. What is also true, however (according to the report), is that his blood-alcohol level was twice the legal limit, that he was found to be carrying rolling papers and a bag of marijuana, and that his saddle bags contained "several beers and a mason jar which he identified as 'moonshine.'" This is what we lawyers call "circumstantial evidence," at least if we are representing somebody found with a mason jar which he identified as "moonshine." But yes, ladies and gentlemen of the jury, it is consistent with what the authorities claim happened. That is true. So let us move on. Let us assume for the sake of argument that the rider was in fact intoxicated. Is it illegal to ride a horse while intoxicated? In Kentucky, of all places? I think the answer is yes. The report says the man was charged with a violation of Section 189.520, "Operating a vehicle not a motor vehicle while under influence of intoxicants or substance which may impair driving ability prohibited." I think that means, first, that whoever writes statute titles for Kentucky should be fired, but that won't help the defendant. And things are not looking good for him otherwise. The statutory language is better than the title: "No person under the influence of intoxicating beverages or any substance which may impair one's driving ability shall operate a vehicle that is not a motor vehicle anywhere in this state." Okay, but what is a "vehicle not a motor vehicle"? I think a skateboard or scooter would qualify, or even a Big Wheel. The Flintstones car would count. Surely someone in Kentucky has one of those. But can a living thing be a "vehicle"? Yes, people ride around on them, but to me the common meaning of "vehicle" just doesn't include a horse (elephant, lion, Sasquatch, whatever). A vehicle is a machine. There is some support for this elsewhere in the statutes. The one above refers to "driving" ability. "Driving" is not the same as "riding" when it comes to animals, according to television. You would "ride" a horse during a cattle "drive," for example; you don't "drive" a horse. And look over here at Section 189.310, "Vehicles meeting other vehicles and animals," which not only distinguishes between "vehicles" and "animals" but also makes the riding/driving distinction. That seems unnecessary if every animal you could ride is also a vehicle, doesn't it? All very interesting, said no one, but aren't there often statutes that define certain legal terms? Yes, and there's one here. And sadly for Rooster Cogburn, it defines "vehicle" as including "All agencies for the transportation of persons or property over or upon the public highways of the Commonwealth.…" So while I still like my "animal is not a vehicle" argument, Kentucky has precluded it. Finally, note that if the officer didn't have probable cause to stop him in the first place, that would be a Fourth Amendment violation, and all the evidence resulting from the stop—blood, pot, beers, moonshine—would be excluded. I suppose a drunken horse rider might cause a horse to weave, so I'd be willing to bet there was some articulable reason for the stop. Actually, maybe the mason jar was for the horse.